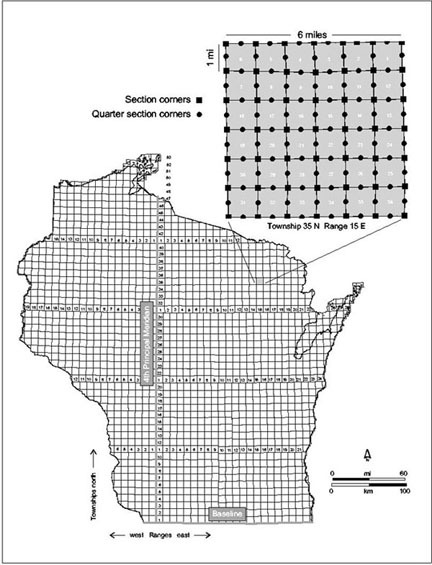 The original land survey of Wisconsin was conducted between 1832 and 1866 by the federal General Land Office. The work was done using the Public Land Survey System (PLSS), which divides land into 6 mile square townships and one-mile square sections. The original PLS notes for Ozaukee County were completed in 1834, and are accessible online at the University of Wisconsin-Madison, General Library System. All across the continental U.S. as well as in Alaska and Hawaii there is a network of survey monuments which are bronze disks about 8 to 10 centimeters in diameter set in rock or permanent structures. These monuments are survey reference points that have been set by licensed surveyors since 1879 and are the basis for the United States PLSS (USPLSS). The reference points, or control stations, are generally set at section corners, quarter-section corners, or center of sections. A dossier sheet is a record of a USPLSS control station, or witness corner. Each sheet contains an identification of the corner and a sketch of the station in relation to important features in its immediate vicinity as an aid to its recovery in the field. The dossier sheets also show all witness monuments and ties, monument coordinates (NAD27) and elevations (NGVD29), a surveyor's affidavit, and the land surveyor's registration seal and signature. USPLSS corner monumentation is complete for Ozaukee County. The dossier sheets are available on-line for most corners in the county.